There is an easy DIY crafts project here as well as lots of elegant pink and grey jungle theme baby girl nursery ideas. The crosses that are hung to each side of the crib canopy are homemade and you can easily make them yourself with inexpensive frames and supplies found at the local arts and crafts store. You might also mat and frame some pictures of safari animals from old books similar to the Painting all of the frames and decor used as wall decorations in the same soft shade of pinks gives the arrangement a smooth flow. Woodworkers might prefer to make their own wooden wall letters or they can be ordered online. Purchase them with the wood left unfinished to paint them yourself and ensure a perfect color match to the rest of the nursery's décor. So many moms worry that they will have problems hanging their baby's monogram on the wall or wonder what kind of hanger will work best. It is really not a problem and the letters can often be hung, as the one in the photo was, using one single nail located in the center of the piece. With a few simple tools like a miter box, a hack saw, glue and some nails you can make your own crib crown using wooden molding. The walls of this nursery are painted with Benjamin Moore mixed AC-34, a shade of grey to match color of the Marcelle crib. The wooden trim is painted in a neutral color called Cape Hatteras Sand. 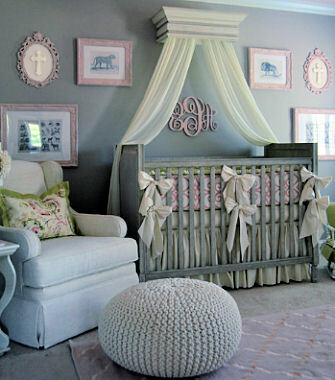 Tip: Paint the nursery walls and the crib in a similar color to make the room seem larger. The hand made framed cross was made using an oval frame and cross bought at Hobby Lobby. The crib bedding is a custom made set that was designed by a designer from Modern Antiquity, LLC. The rug is the "Merle" area rug that is available for purchase from RH Baby and Child. I hope that Unique Baby Gear Ideas' visitors have enjoyed the tour and have seen some pink and grey jungle theme baby girl nursery ideas that can be used in their own decorating project.